Our mission: We will be the worldwide market leader within energy efficient technology for industrial applications, being the natural choice for manufacturers seeking green environmental solutions. EU has stated seven flagship initiatives for 2020, including an increase in energy efficiency by 20%. Within our field, our technology represents a potential to increase the energy efficiency in the range of 30%, which is far better than the EU target. The overall objective of our innovation projects is to offer a far more energy efficient machine technology based on our new, patented CR-T (Centric Reciprocating Technology). Our mission is to transform the CR-Technology into practical solutions with respect to the use and manufacture for different purposes / markets like the OTTO-type combustion engines (CRE), industrial compressors (CRC), pumps (CRP) and heat recovery (CRR). In addition, OTECHOS has developed a unique metal to metal sealing technology, the Delta V-Seal™, the world’s first DNV GL type approved gasket, which now is marketed internationally through our subsidiary, Pipeotech AS in Norway. One of OTECHOS’ unique technology products is the CRE engine, which is a totally new engine technology. CRE are initials for ”Centric Reciprocating Engine”, which is an internal combustion engine, where a pair of two rotors moves forth and back related to one another around a common center axis, - further rotating simultaneously around the very same axis, creating chambers performing the phases of suction, compression, expansion and discharge of the exhaust gases. This movements can be considered to be very alike those of a piston and cylinder in a usual 4-stroke piston engine, and even the respective diagrams are relative comparable. The control of the rotors, as well as the transfer of torque and the synchronizing are secured by a mechanical Control Unit which as well as the Motor Unit is practical vibration free, - from the inertia point of view. • No mechanical valves, with two ports only for intake and exhaust gas exchange, - one inlet and one exhaust pipe. • Ignition provided by a single spark plug or as on the prototype; two plugs in toggling parallel. Further using a single coil (in the prototype also two), and no distributor, - all full electronic controlled. By diesel process one single injection nozzle would be used. • Very small footprint and extremely low weight. • A relation between the surfaces in the combustion chamber versus cycled volume that is lower than that of a piston engine, points clearly to lower thermal loss and a higher efficiency. Added to less mechanical losses, reduced fuel consumption in the order of 20 % is calculated compared to a modern car engine. • Interface with non touching dynamic sealing between the rotors provides an engine free for lubricating oil consumption, and also locks up for use of gases that is known to being cracking oil and oil film. HC emissions would become zero. • CRE can utilize turbo charging on likely conditions as piston engines. Additionally, it also can achieve benefits of not having the piston engines disadvantages regarding simultaneously opening of the inlet and exhaust valves. The Prototype(CRE X1) is built as an approx. 200 HP suction engine with a respired volume of 1.15 liter, corresponding to 2.3 liter stroke volume of an 8 cylinders piston engine. Typical it has a circular shape with a diameter of 320 mm and a length of 570 mm, including the coupling to the brake in the test bench. The engine is built ”solid state”, having a coherent body containing the Motor Unit(A) and the Control Unit(B), as shown in the angle mixed section view left. The prototype is rather well proportioned as a result of the parts being machined out of solid blocks, where no special respect to the weight of stationary parts has been taken by its whole design. Still the weight is approx. 68 kilo, ex. the attached equipment. 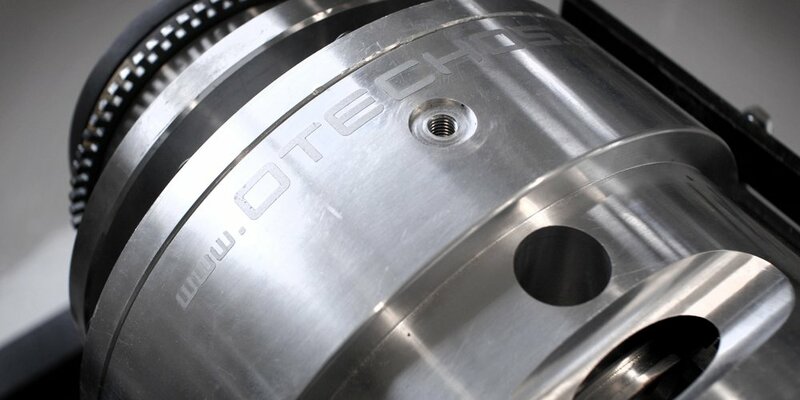 The CRE Engine can in addition to be used individually also be used together with OTECHOS’ unique technology, the CRC compressor and the CRP pump. The CR technology is patented. CRC takes its main advantages in the compression process by no mechanical touching parts in its process chambers, as well as there are no mechanical valves incorporated. This means that there are no need for lubrication, - and also that water injection during the compressing can be used. Water injection, cooling simultaneously with compression reduces the energy consumption considerably and also performs a sealing effect between the parts, - forming the chambers for suction and discharge.